Have your legs officially gone into hiding? 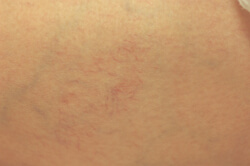 Are you embarrassed or worried about the appearance of spider veins? If so, you’re not alone. This is a common problem for about half of all people over the age of 50. The medical term for small veins is “telangectasias”. Spider veins is a descriptive term because these blood vessels often look like a tangled mass of fine threads, much like a spider’s web. Unlike larger varicose veins that bulge out above the skin’s surface, spider veins are flat and even with your skin. So, what exactly causes spider veins? There are many factors that increase your risk for spider veins, and pregnancy, obesity, or being on your feet all the time are just a few. The biggest influence is genetics. If they run in your family, then you’re likely to develop them. Leg veins are designed to function like a one-way road: blood is supplied to the legs via the arteries and is supposed to flow back up through your leg veins to your heart and lungs. The blood return to the heart occurs against the pull of gravity. To counteract gravity,, your leg veins have a series of one-way valves that keep the blood from settling downward. Genetics can make these valves “leaky.” When this happens, blood flows in the opposite direction that it’s supposed to, pressure increases, and the veins become larger and more visible. Spider veins can also show up on your face (cheeks and nose are common).In the face, these changes are often triggered by sun damage which causes the capillaries to enlarge and your skin to thin. Spider veins on the face are not related to the valve problems we discussed above. 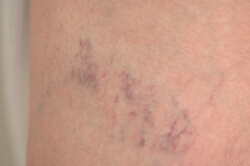 Spider veins are rarely a medical problem, but more often a cosmetic concern. Luckily, good treatments exist! Class IV medical lasers offer you great results with little discomfort or downtime. These lasers can be used anywhere on the body and are safe for any skin type (color). While you might need a series of treatments to get rid of all your unwanted spider veins, laser treatment is very effective and gives most people amazing results.